Bruce Cockburn is a Christian. I have never seen him perform, and I don’t know what he is as a man. But, in his records he expresses a faith that is revealed by love and fierceness and liberalism and care for the unfortunate and reverence for the natural world and rage at injustice. Cockburn is no prophet, but the sensibility of his music puts shame to anyone who would follow the false prophets, like Jerry Falwell and Pat Robertson, that I discuss elsewhere in these writings. But without the music his message would be lost. Listen to the fluid purity and sweet vibrato of his tenor voice. This song, “Let Us Go Laughing,” is in two parts with an instrumental interlude. The first is a meditation on nature that is illustrated by languid finger picking on his Martin D-18. He sings of sitting in a canoe at twilight watching and listening to the bones of the day, a pale protectress moon, ragged branches vibrating in the wind, silent distant lightning – he is contemplating his own mortality. In the instrumental part of the song he plays a duet with Eric Nagler on mandoline banjo, which is hybrid banjo that is strung in courses (double strings) and is tuned like a violin. Their picking is luminous, meticulous, and vibrant, but they loosen up the folk and classical progressions with bluesy modalities. And then in the third part he primarily forgoes finger picking for folk strumming. He offers an answer to the problem of mortality. We know where we will end up, but until then, life should be about laughter. Hah, I know laughter. I wonder if Bruce Cockburn likes to hang out in taverns and tell ribald jokes. I think Jesus did. Bruce Cockburn, “Let Us Go Laughing,” Golden Mountain Music (BMI Canada) (1971). 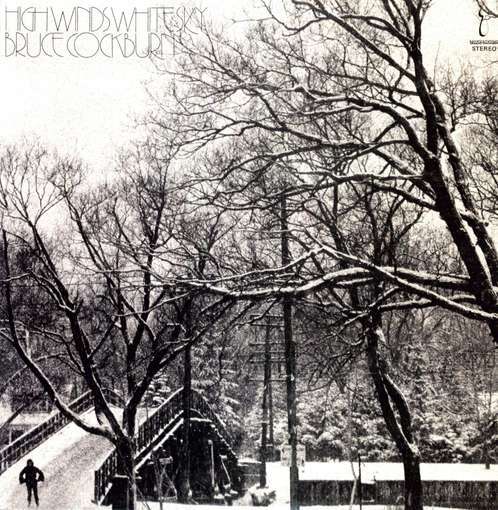 From Bruce Cockburn, High Winds White Sky, True North Records, TN-3 (1971). Album design – George Pastic; Photography – George Pastic.